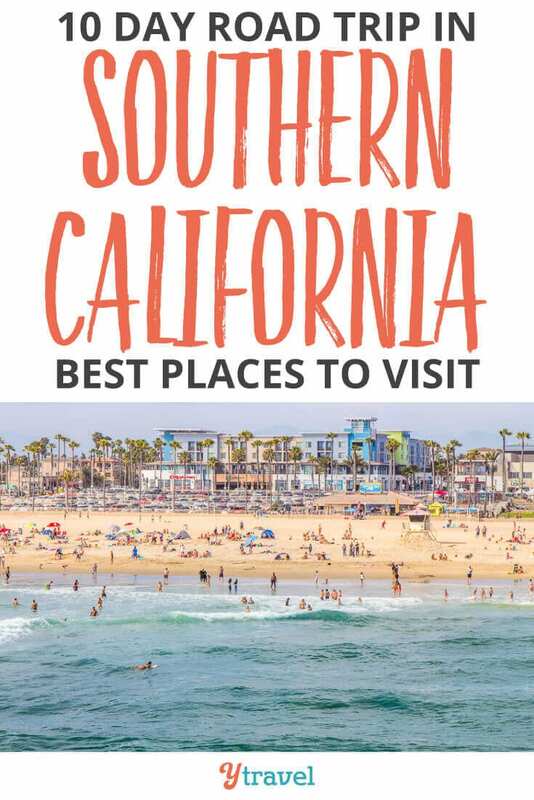 Looking for tips on the best places to visit in Southern California? Are you ready for some SoCal adventure on a West Coast road trip? We’ve got you covered! 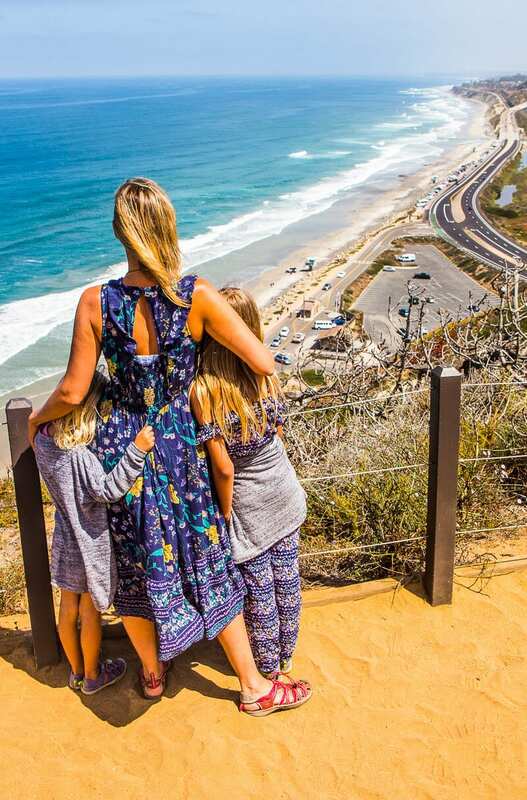 In this 10 day Southern California road trip itinerary we’re talking about outdoor adventures, delicious food, gorgeous scenery, family fun and sunny weather. Just so you are clear, Southern California (SoCal) is typically the region from San Diego up to San Luis Obispo (just north of Santa Barbara). 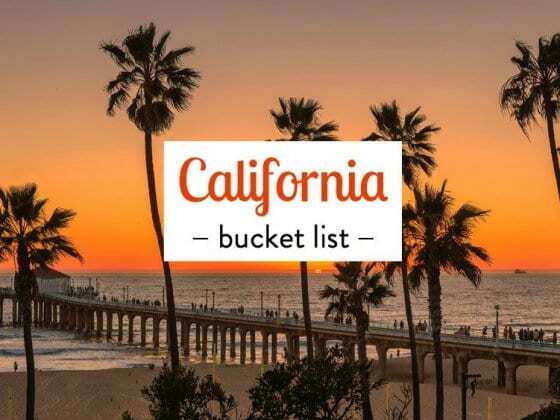 Not only does it include the gorgeous coastline, but also the growing wine region of Temecula, beautiful mountain regions and desert areas like Palm Springs and Joshua Tree National Park. There are so many amazing places to visit in Southern California and it offers a different experience to Northern California. SoCal is the perfect destination for a short USA road trip. 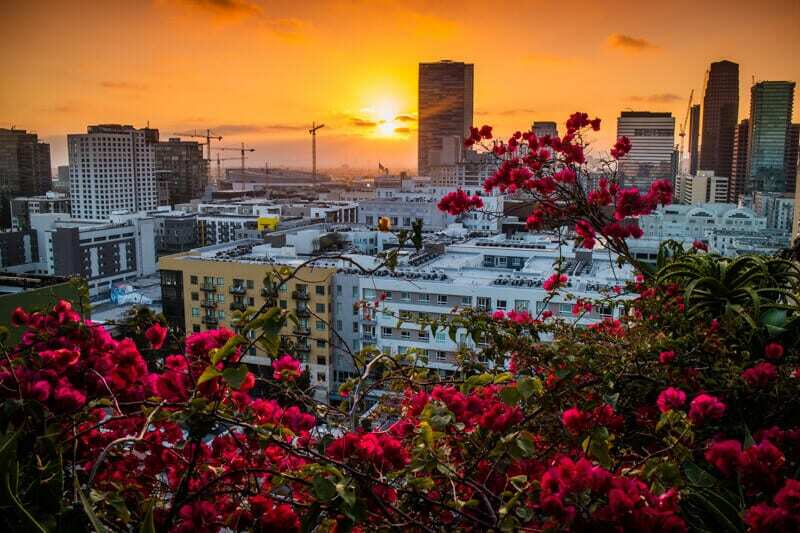 Los Angeles is about in the middle of Southern California with only a 3 hour drive to the northern border and two to the southern. When you think of Southern California attractions, of course Disneyland Resort comes to mind. We didn’t do theme parks on this trip, but are going to Disneyland in September – stay tuned! So this post focuses on things to do beyond Disney, and since so many international travelers fly into LA, it’s normal to want to explore this region more in-depth. 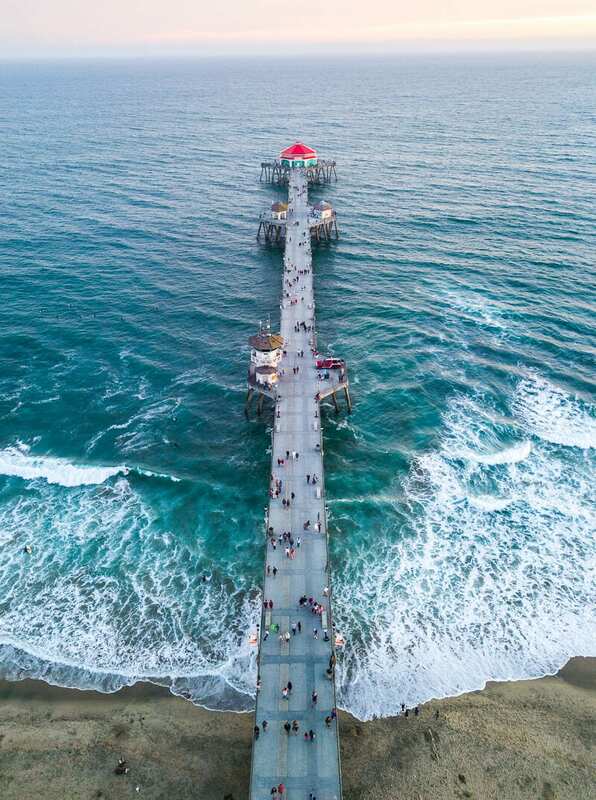 We visited San Diego County, then Orange County and Ventura County on a paid campaign with Visit California to share the amazing Kidifornia Adventures on offer in this Golden State. 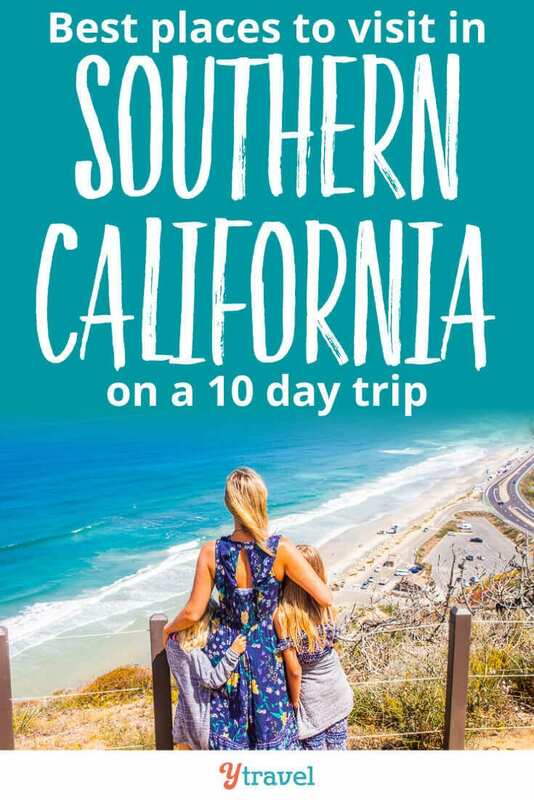 We thought we’d share with you our Southern California road trip ideas, and all the fun things to do in Southern California in this 10 day itinerary post! 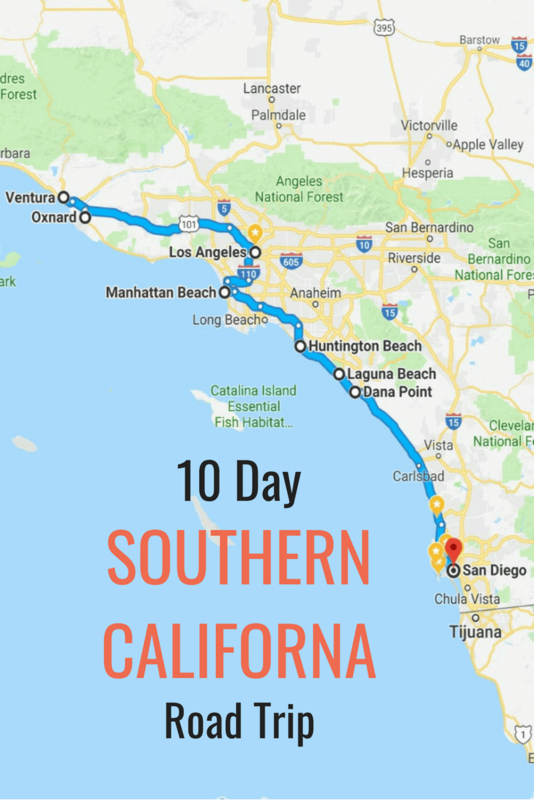 For you locals, feel free to break this itinerary down and use it for day trips in Southern California, or weekend getaways in California. We had a fantastic time on this California road trip with kids. Our girls loved being back near the beach and the relaxed coastal vibe that California has. I loved how our Southern California road trip was also quite an educational trip for our kids. They learned a lot about California history, AND are now curious and inspired to visit Mexico, due to experiencing the Mexican influence in the region. We love how travel can open up their worlds and help them celebrate differences rather than fear them. 11am – Time to Explore La Jolla. Fly into San Diego and pick up your rental car. You can then drop the car off at Los Angeles Airport (LAX). Or, alternatively, fly into LA and drive to San Diego. You can then easily return your car to LAX and save yourself money. One way rental drop offs are always more expensive. Of course, you can change the order of this itinerary. Perhaps it may be better for you to head north to Ventura first and then finish in Orange County. 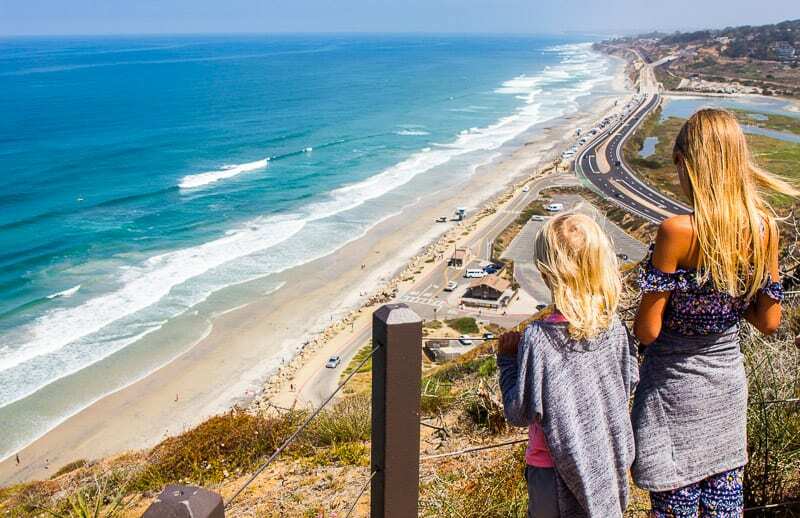 San Diego has to be one of the best places to visit in Southern California for families. Arrive and check into your accommodation. 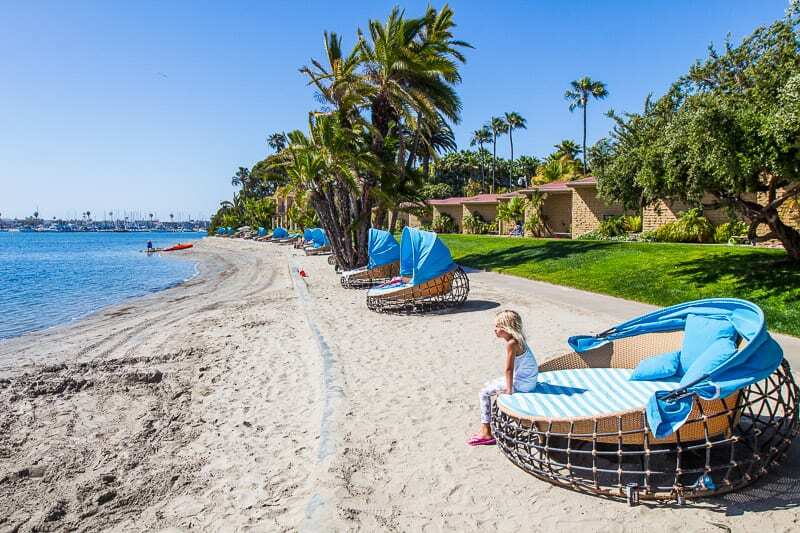 Our recommendation for family accommodation in San Diego is the Bahia Beach Resort. It’s a couple of blocks back from Mission beach, but it is on Mission Bay with its own private beach and has lovely cabin style accommodation with delicious food in the restaurant. 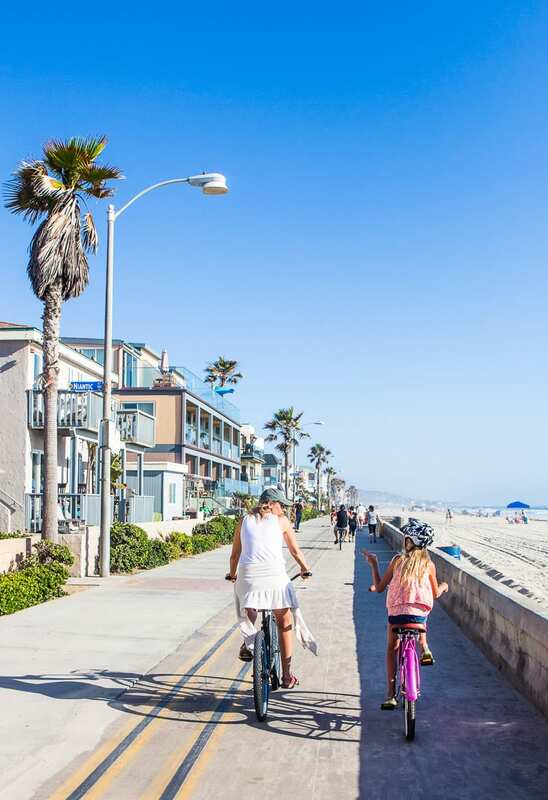 You can rent bikes from Action Sport Rentals at the resort and slip into San Diego style with a bike ride along Mission Bay to the Catamaran Resort before cutting back west to the Pacific Beach Pier. Ride back to the resort along the beach boardwalk. Take your time to soak it all in. We recommend stopping for a local craft brew for you, a Squirt Mexican soda for the kids, and a plate of shredded beef nachos at South Draft Mission for a snack. It’s right on the beachfront near Belmont Park and at the turn off to go back to the resort. 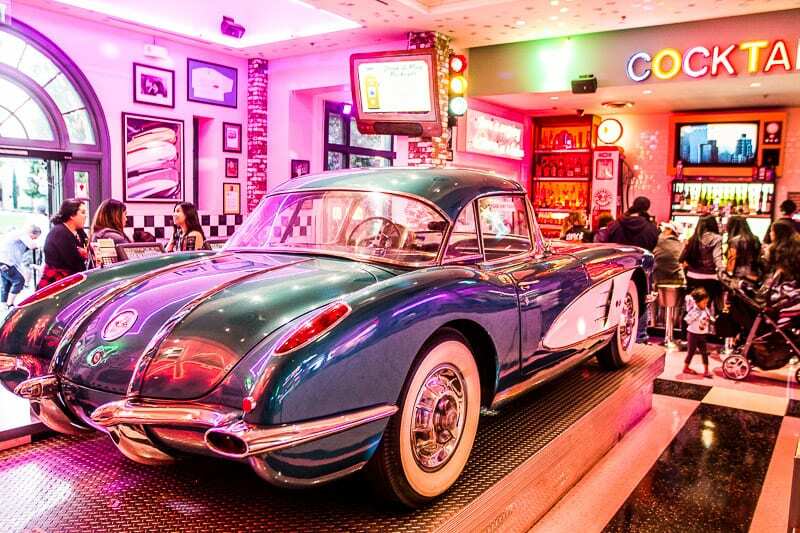 For a quirky and retro dinner, head to Corvette Diner. It’s unlike any place I’ve been before. Or, if you want to stay at South Draft Mission, make it your main meal, watch the sun go down and then enjoy a few rides at Belmont Amusement park next door. If you go to Corvette, you may not have time to get back to the beach before sunset. Sunsets in California are special and quite the nightly event. Lucky for you, Bahia Resort has a delicious buffet breakfast or ala carte. We also discovered Better Buzz Coffee Roaster (thanks to a tip from our Instagram community), which was just down the road from Bahia which did great coffee, smoothies and acai bowls. Put your walking shoes on and head into Torrey State Pine National Reserve. It’s one of the best places to visit in Southern California for coastal hiking. Happy to tick that off our bucket list. Aim to arrive by 9am at the latest, and we recommend the Guy Fleming Trail for varying landscape, seeing the Torrey Pines, and coastal vistas with some of the best views in Southern California! If you have time for another trail, I would have loved the Razor Point Trail and climbing the Red Butte. 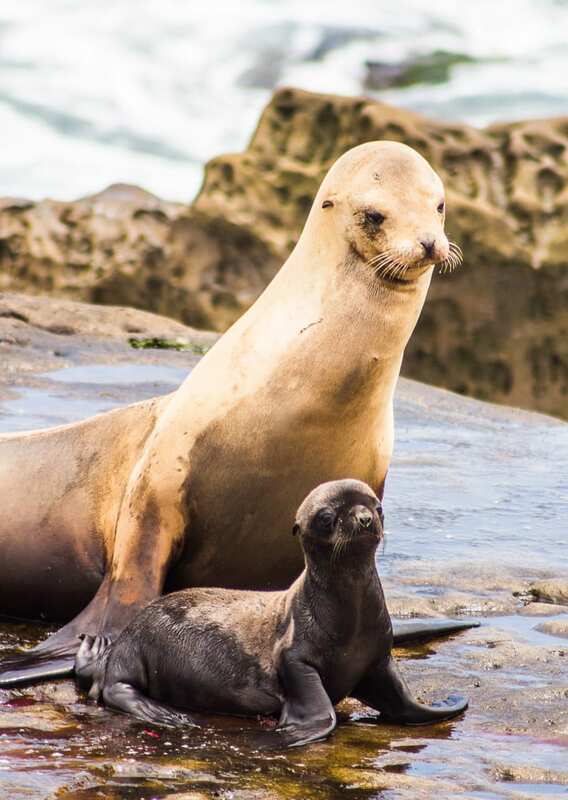 La Jolla is one of the best places to go in Southern California to see seals. Start at the La Jolla Caves and walk around to La Jolla Cove to see the resident seals. You could continue walking around to see more seals at the Children’s Pool. There is also great tide pooling here. If you have more time, and want to have more of a relaxing beach day, La Jolla Shores is great for families. For coffee lovers, you can’t go past Bird Rock Coffee Roasters in the small town of Bird Rock. You can’t go past cheap and delicious fish or shrimp tacos at local institution Oscar’s Mexican Seafood. This hole in the wall with bright murals on its outside walls is on the border of LA Jolla and Pacific Beach. Balboa Park is America’s largest urban cultural park, and is ranked as one of the best parks in the world. It is one of the most unique things to do in Southern California. With 17 museums, a wide variety of gardens, and the San Diego Zoo you could easily spend a day in Balboa Park. Plan for an afternoon here. We recommend a visit to the Fleet Science Center, the Spanish Village Art Center and the Japanese Tea Gardens. The food at Café Bahia, which is situated in your resort is delicious. My recommendation is the sea scallops with grilled corn diced chorizo and chili oil on a bed of herb ricotta. It bursts with Southern California flavor and is one of the most innovative dishes I’ve ever had. Rent some kayaks and stand up paddle boards from Active Sports Rentals at the Bahia Resort and have a relaxing hour or so out on the water. It’s calm and peaceful and a great way to connect to each other and Mother Earth. 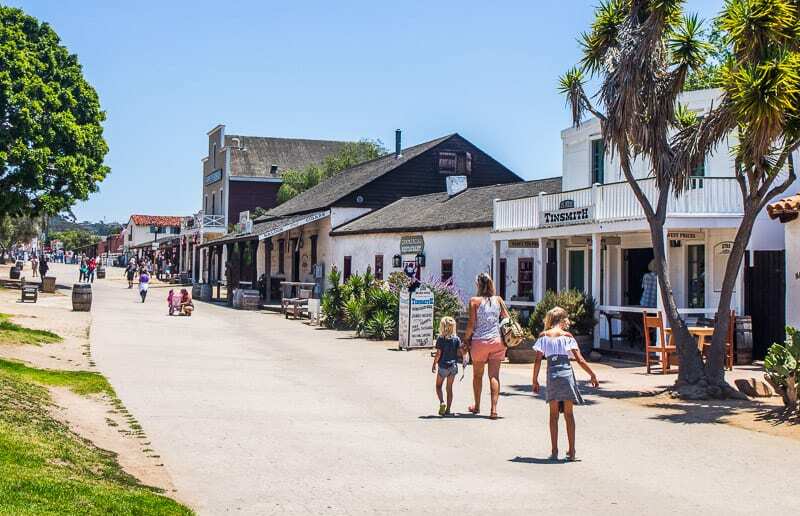 If you have time, and want to experience a little history and culture then head to Old Town State Historic Park, which is San Diego’s first “downtown,” and represents San Diego’s Hispanic heritage from 1821 to 1872 through museums, live reenactments, and historical buildings. It’s a pretty area with a cute fiesta market and plenty of Mexican restaurants. If you’d rather spend time at the beach then head straight to Ocean Beach and perhaps visit Cabrillo Monument and the tidepools. We ran out of time to fit this in but it came highly recommended by our community as a top ten thing to do in San Diego. 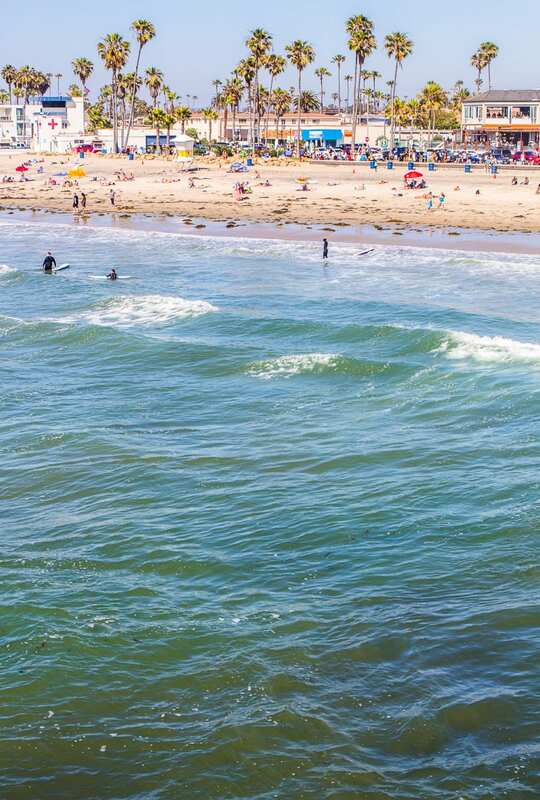 Ocean Beach is a gritty, more local feel than the other San Diego beach towns. It’s one of our favorite places to visit in San Diego. It has more of a cove beach than the wide sweeping Pacific. They have good waves near the pier, beach volleyball is popular and so is hanging out on the grassy strip hoola hooping, slacklining, and bongo jamming. Join in! 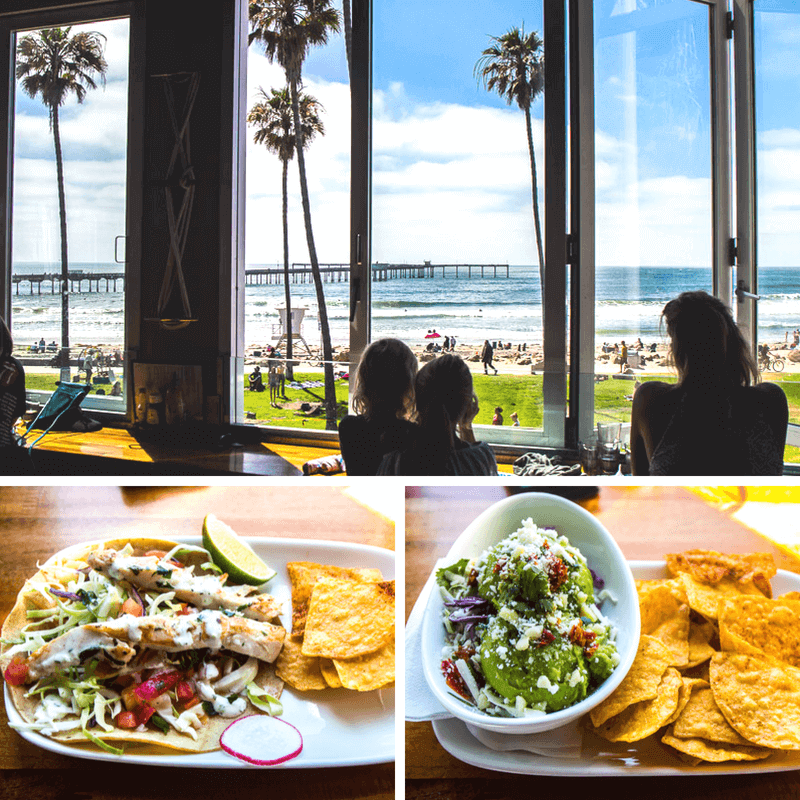 Tacos and guacamole with a view is what you have at Wonderland Ocean Pub, an upstairs bar and restaurant across from Ocean Beach and the grassy strip. You won’t be bored watching the OB life go by. San Diego is known to be one of the best places in the US for craft beer and you’ll find a few breweries along the main street (Newport Ave). If you are a craft brew lover then perhaps pop in for a sample as you wander the OB area. We went to Belching Beaver Brewery. They have jenga, which kept our girls happy while we tried a local brew before going back out for market shopping. 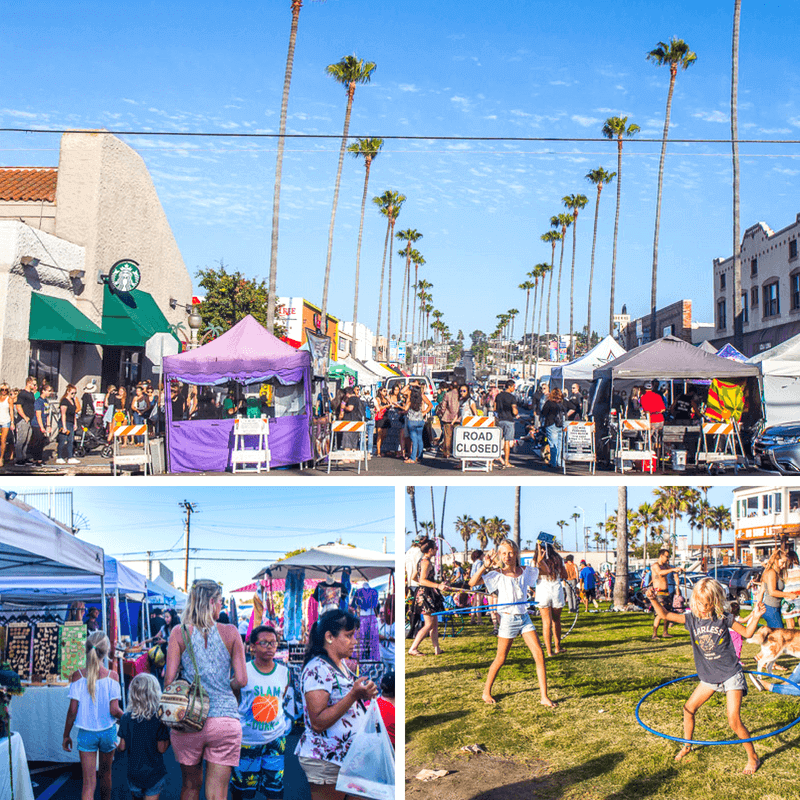 If you visit on a Wednesday, be sure to check out the Ocean Beach Farmer’s Market from 4 – 8pm in Main Street. 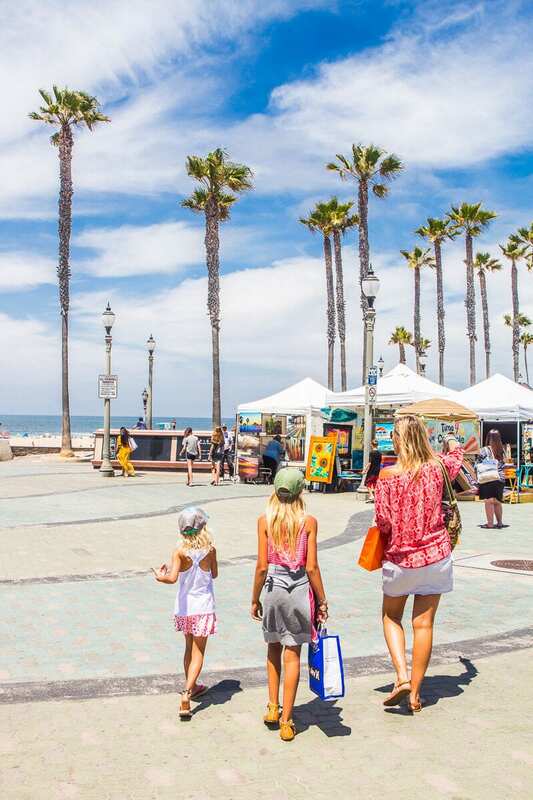 With food stalls, live music, and local artisan goods its definitely a fun thing to do in Southern California. Grab some food here and then head to Sunset Cliffs for sunset. 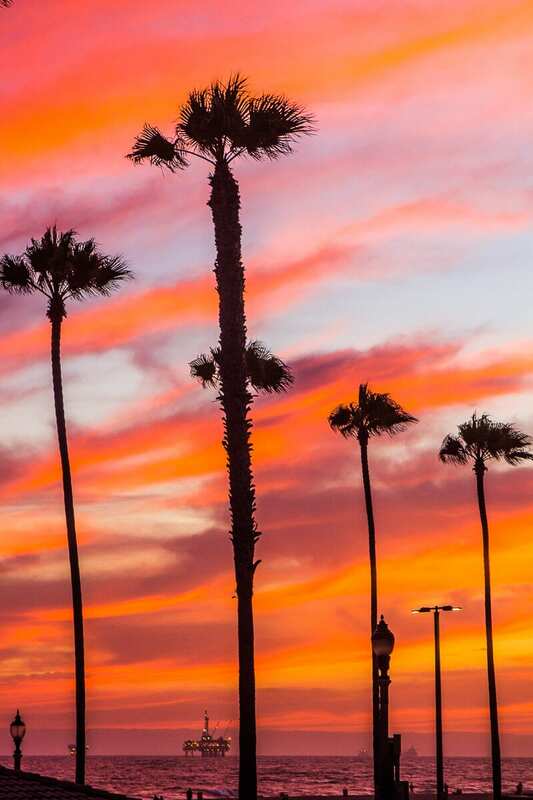 When you think about free things to do in Southern California, it’s hard to beat a famous California sunset. And Sunset Cliffs is one of the best places to visit in Southern California to watch the sunset. If you have kids like us, there is a wide open space for them to play on the rocks safely back from the cliff face, while you relax and watch the day close out. Grab an ice cream at Hammonds Gourmet Ice Cream in either Point Loma or back in Pacific Beach. 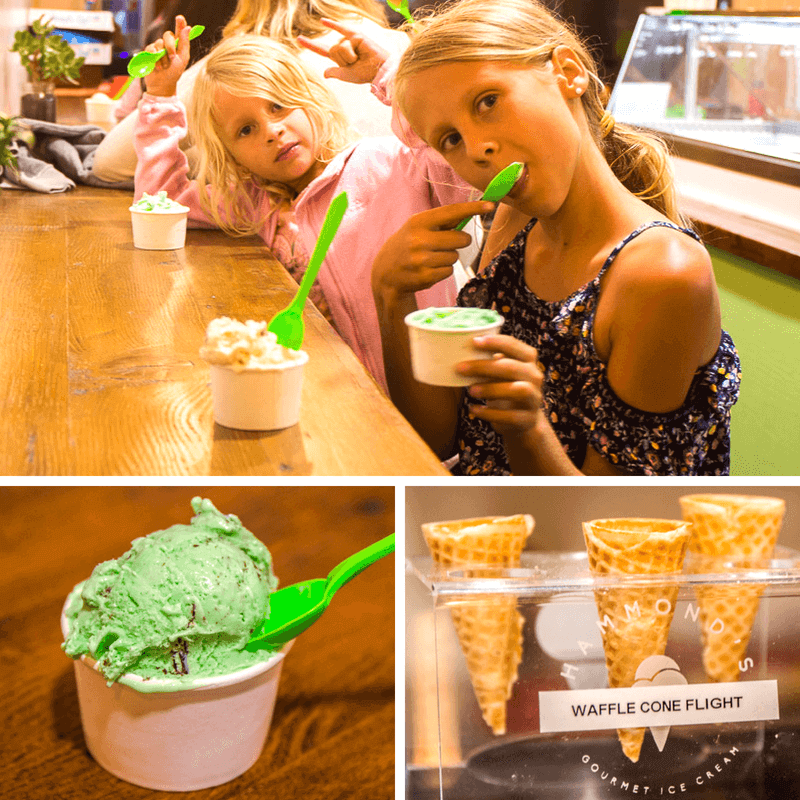 It’s listed as one of the best places for ice cream in San Diego and we liked it a lot. Can’t decide on a flavor? Sample a bunch with the waffle cone flight. Click here for in-depth information about things to do in San Diego with kids. 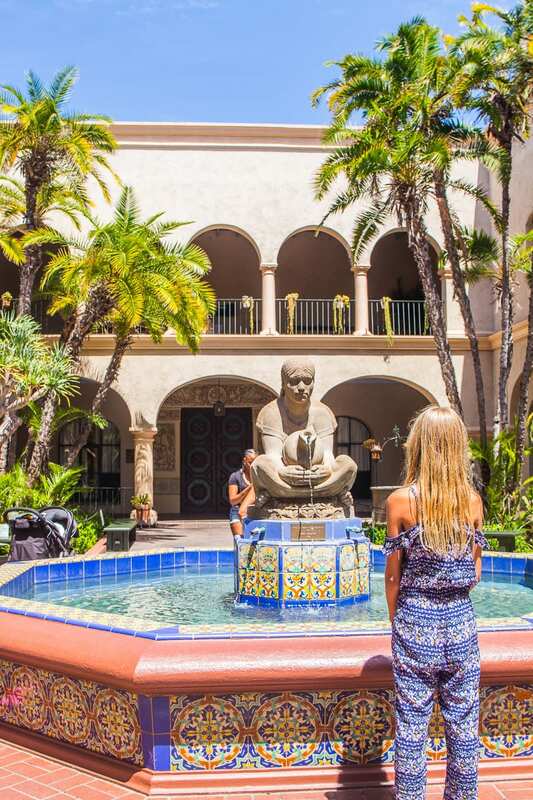 For places to stay in San Diego check out Bahia Resort. Or here are other places to stay in San Diego. If you plan on visiting several San Diego attractions, get yourself a San Diego Go Attraction Pass. You can build your own pass based upon what you want to see and do. It will save you money! I know you are sad to leave such a cool place like San Diego. But don’t be. You are in for a treat in Orange County – sweet and refreshing, just like the fruit. 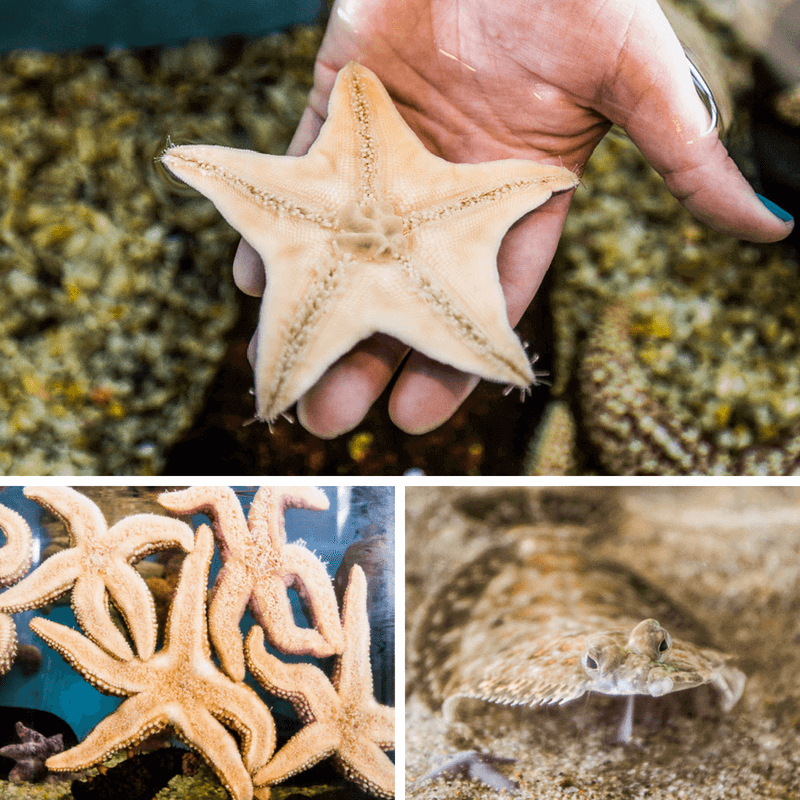 If you, or your kids, are ocean lovers, you may wish to stop at Dana Point Ocean Institute on the way to Huntington Beach to learn more about ocean life on a behind the scenes tour at the Ocean Institute. Dana Point Harbor sits at the bottom of the rugged cliff faces so is really pretty. You may want to arrive before 10am to walk around and explore a little. There’s a lovely calm swimming beach here as well. Not to be missed is the birthplace of Orange County, Mission San Juan Capistrano. With its crumbling sandstone walls, it’s bell wall, bougainvillea draped pathways, and flowering gardens, it’s one of the most interesting places to visit in Southern California and a pretty place to wander for an hour. While here walk around the Los Rios Historic district to get an inkling of life centuries ago. You’ll love Ellie’s Table for a light lunch situated in the old 1883 Judge Egan House. My soup and quiche were filling and delicious. Save room for a special bakery treat after it. You’re now heading to our favorite place in Southern California, Huntington Beach. HB has the perfect beach lifestyle vibe for us Aussies – not too pretentious, or busy. It’s laid back with a touch of sophistication and has the surf and the beach as the focus of life! Check into the Kimpton Shorebreak Hotel. You’ll want a bit of time to enjoy this hotel when you check in. A room with an ocean view is a magic way to start the day. The Kimpton would be one of the best beach hotels in Southern California. Head down to the common courtyard area for 5pm wine social hour. You can play ping pong and foosball, and sit around the fire pit chatting to other guests. Return later when the sun has gone down to roast s’mores with your kids over the fire before bed. Not to be missed is dinner at the hotel restaurant, Pacific Hideaway. It’s one of the best things to do in Southern California from a foodie perspective. The Southeast Asian or Latin American inspired food and wine was just as extraordinary as was the service and the funky décor. P.S. Aussies, they have pavlova! Duck on over to the beach to catch the sunset after your dinner. You can buy some firewood and smore ingredients to roast smores on the communal beach firepits after, or go back to the Kimpton to do it in their courtyard. Can you finish a Southern California day in any other better way? Great news! The breakfast at Pacific Hideaway is just as delicious as the dinner. So stock up for your day exploring. 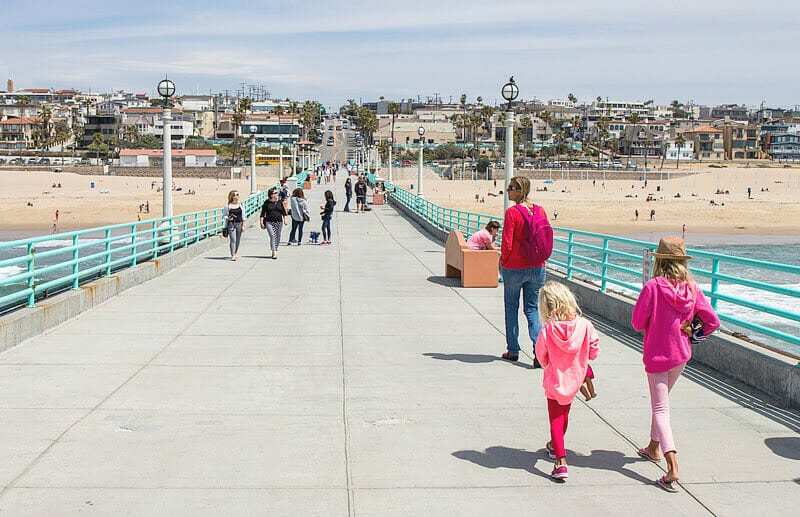 Take the morning at leisure to explore what makes Huntington Beach so cool. Main Street is where you’ll find great shopping, especially for surf brands. Along the Pacific Coast Highway is where you’ll find Pacific City, a new modern shopping, dining and entertainment space overlooking the beach. On Fridays, at the bottom of the pier is a local artist’s market. And there is the small, but cool International Surfing Museum. You may even want to play on the beach, go for a swim, or rent bikes to cruise along the beach path. 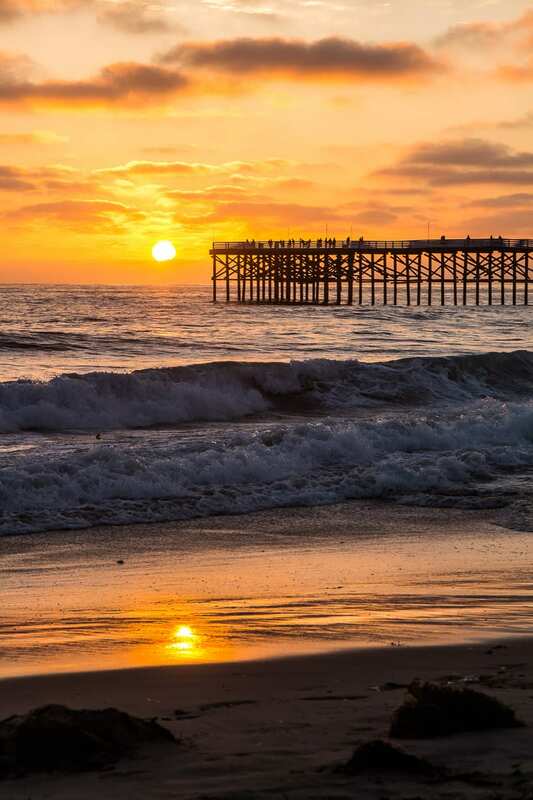 Huntington State Beach is one of the cleanest in California one of the best Southern California beaches for surfing! 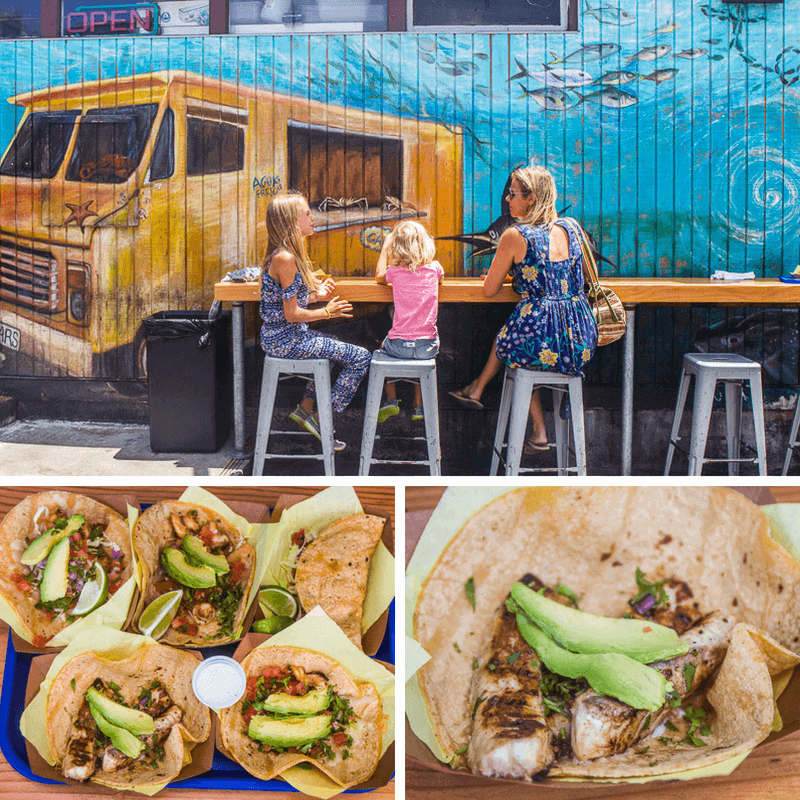 Top lunch options include Wahoo Fish Tacos, Sugar Shack Café and Duke’s. 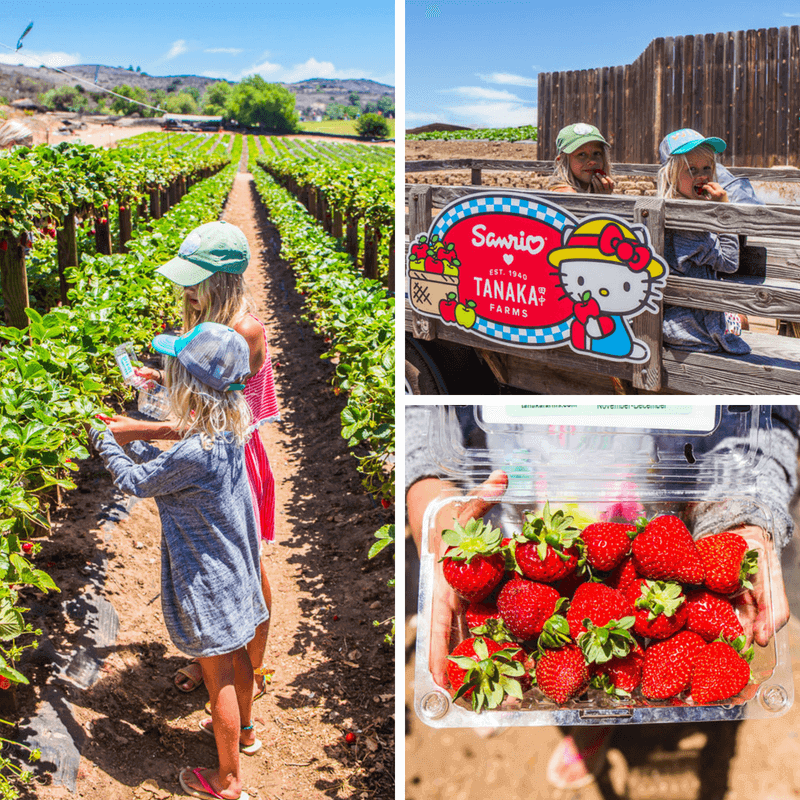 If you’re up for it, drive to Irvine (30 mins) for a tour of Tanaka Farms and some strawberry picking. California is not just about beautiful beaches and lively culture. Some of the world’s best food trends are born from this state, which has a lot to do with the wonderful produce that is grown in its various regions, including many berry farms. Explore a bit of that at Tanaka Farms. Not only will you get to eat strawberries straight form the vine but also other produce growing like onions, and sweet corn, which was the most delicious corn I’ve ever tasted. All of it is grown organically and the kids will love touring around on the back of a farm truck. Our girls thought it was one of the most fun things to do in Southern California. 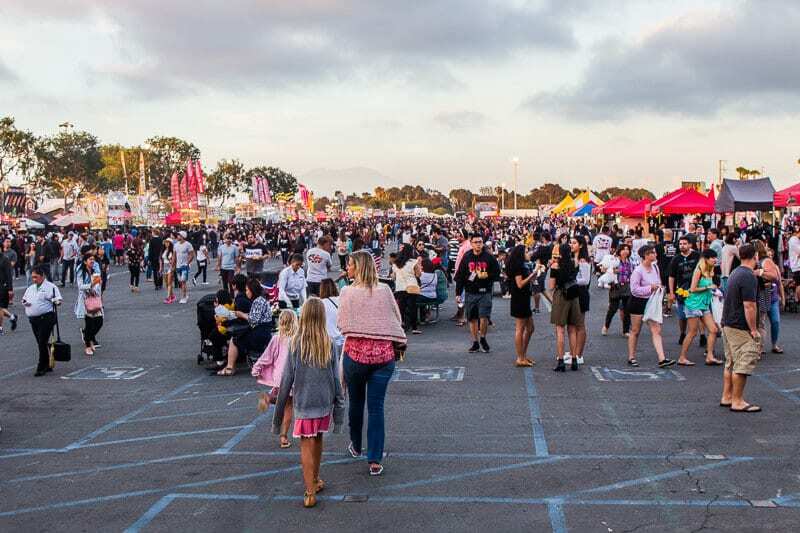 If you here on a Friday night, for an interesting cultural experience, consider the huge O.C Night Market. It’s held at the state fairgrounds, which are lined with food trucks, merchandise, arts and entertainment. Be sure to grab your giant baby bottle filled with boba milk tea. Alternatively, just head back to Huntington to eat at one of the restaurants and catch another Southern California sunset. Don’t forget those smore’s again! 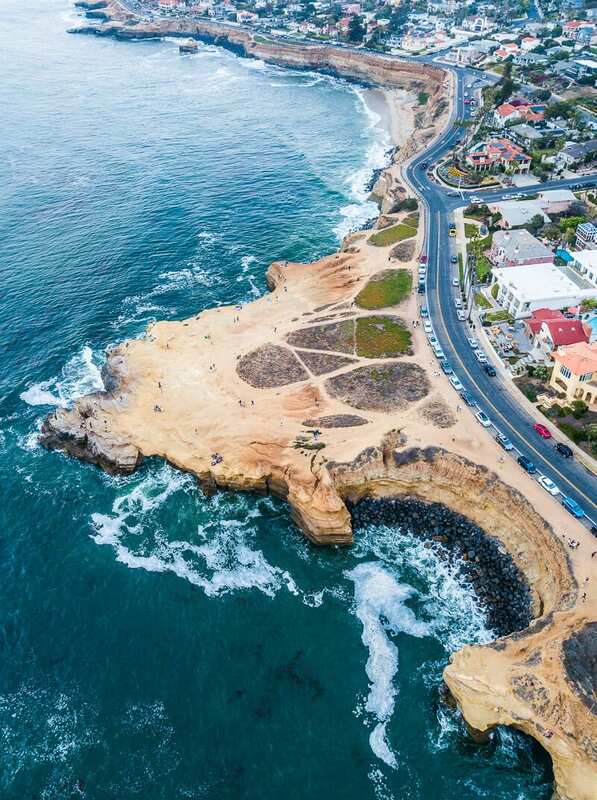 Possibly the most famous places to visit in Orange County are Newport and Laguna Beach. Newport is said to be California’s Riviera and Laguna Beach is the artistic community filled with beautiful cove beaches. They make for an easy day trip from Huntington Beach. Lot where John Wayne used to have his home. A Duffy boat tour is a wonderful way to get to know the relaxed life of Newport. 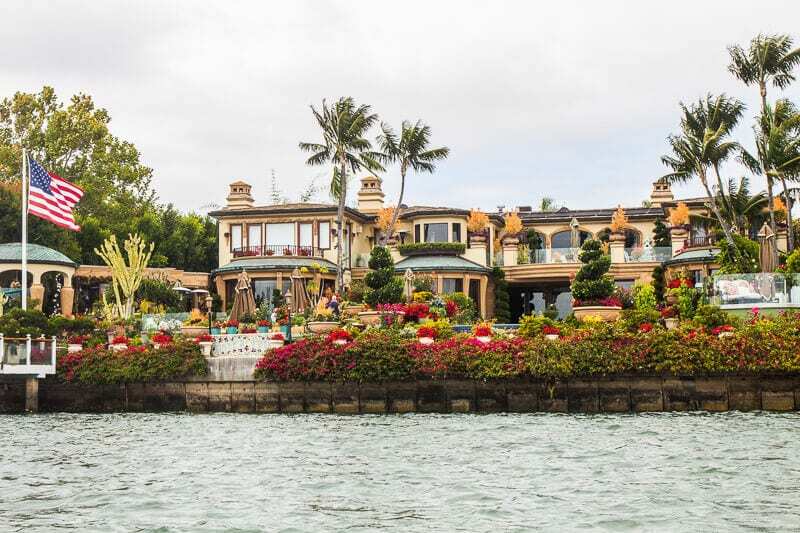 You’ll cruise past many mansions on the different islands, including Shirley Temple’s childhood home, the beach where some of Gilligan’s Island was filmed, and John Wayne’s old lot. Don’t miss their fish tacos! If you have time and have young kids, you may want to stop for a carousel ride at Fun Zone after your Duffy boat, or at least an ice cream from Cowafornia. You may want to add extra time in Newport and visit Corona Del Mar Beach or Newport Beach “Back Bay,” which is a 135 acre park with hiking and biking trails. The Laguna Beach area has seven miles of coves and canyons, offering you plenty of outdoor activities and Laguna Beach beaches to enjoy. 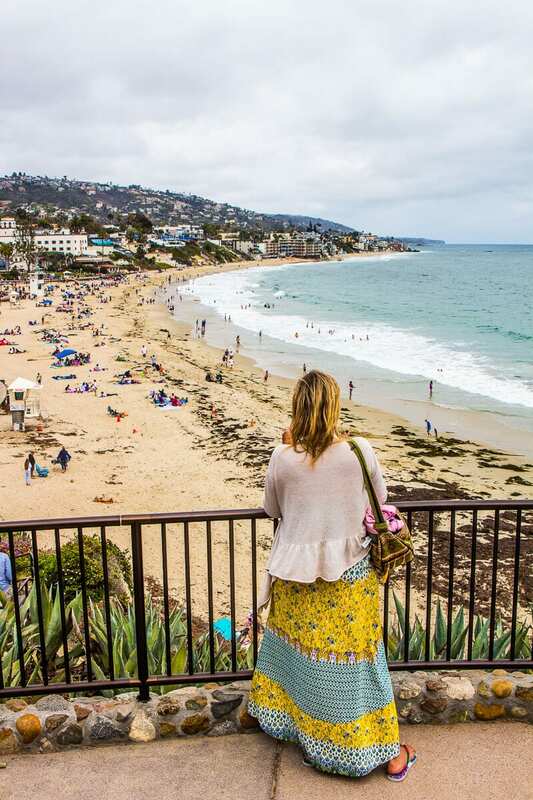 Laguna has the main beach at the edge of downtown, or a plethora of beaches to choose from. For tide pools head to Shaws Cove, Picnic Beach, and Treasure Island Beach. Other beaches to check out include Victoria Beach with the natural pirate tower, Treasure Island Beach and 1,000 Steps Beach. For art lovers, don’t miss the Laguna Art Museum, which only collects California art. 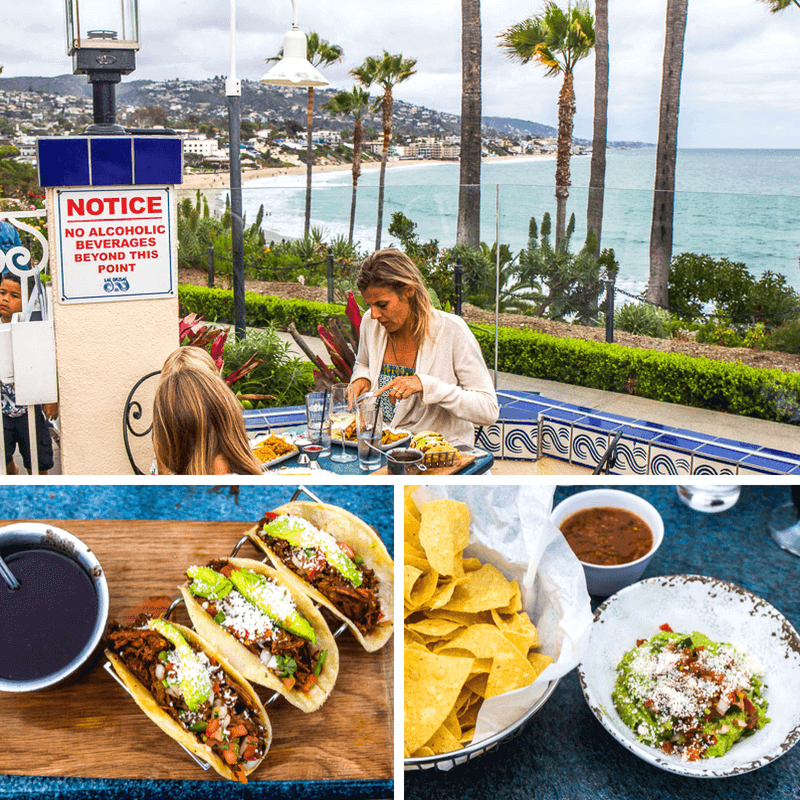 Las Brisas came highly recommended to us for extraordinary views over Laguna Beach and fantastic Mexican food. They were correct on both accounts! It’s best to reserve a table if you want to sit inside. Otherwise, it’s first come first serve for the outside seats, which I think is better. Click here for in-depth information about these things to do in Orange County with kids. Where to stay in Orange County: Check into the Kimpton Shorebreak Resort. It’s one of our favorite hotels in America. Here are other places to stay in Orange County. Orange County is also home to Disneyland. So if you have arranged for more time on your Southern California road trip to incorporate a visit to Disneyland, this may be when you want to do it. Or, even at the end of this trip. Our readers love this roundup post we did finding the best hotels to stay at in Disneyland. Ventura County, California is about an hour north of LA and 30 minutes south of Santa Barbara. Be sure to leave your pretense and busyness on the highway out of LA, because it doesn’t belong in Ventura County. Plan for about three hours for your drive from Orange County to Ventura. 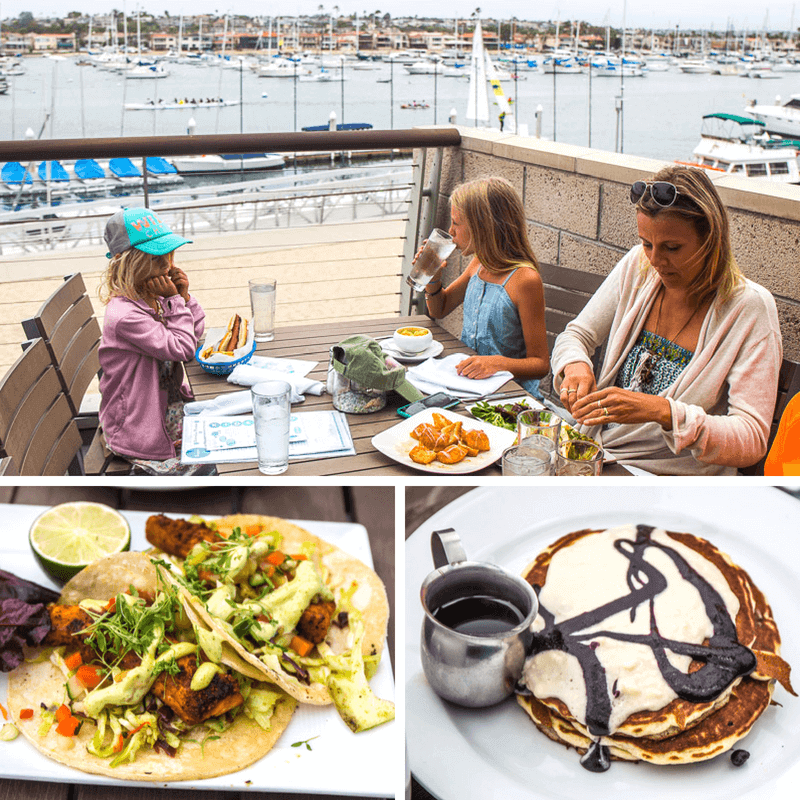 You can stop in at Oxnard Harbor for lunch on the water on your way into Ventura. It’s about 15 minutes from downtown Ventura. 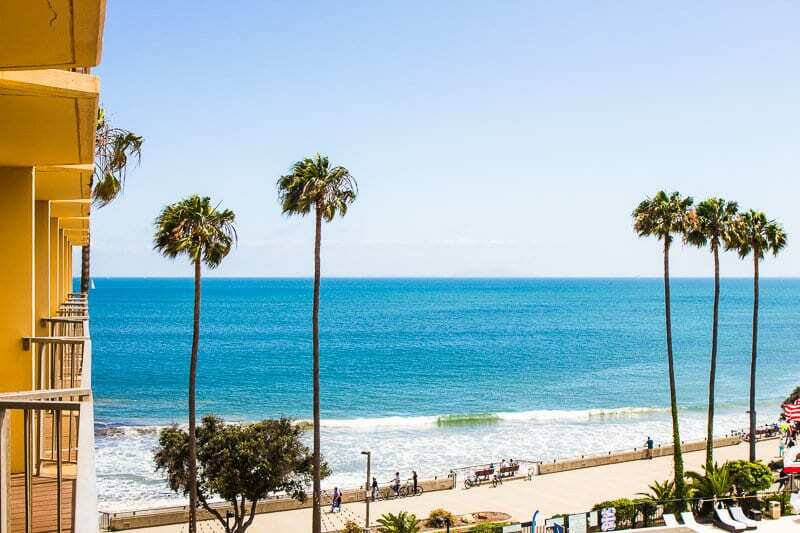 The Crowne Plaza Hotel Ventura is walking distance to downtown Ventura and right beside the Ventura Pier and a popular surfing break. Most rooms have ocean views. We loved downtown Ventura. 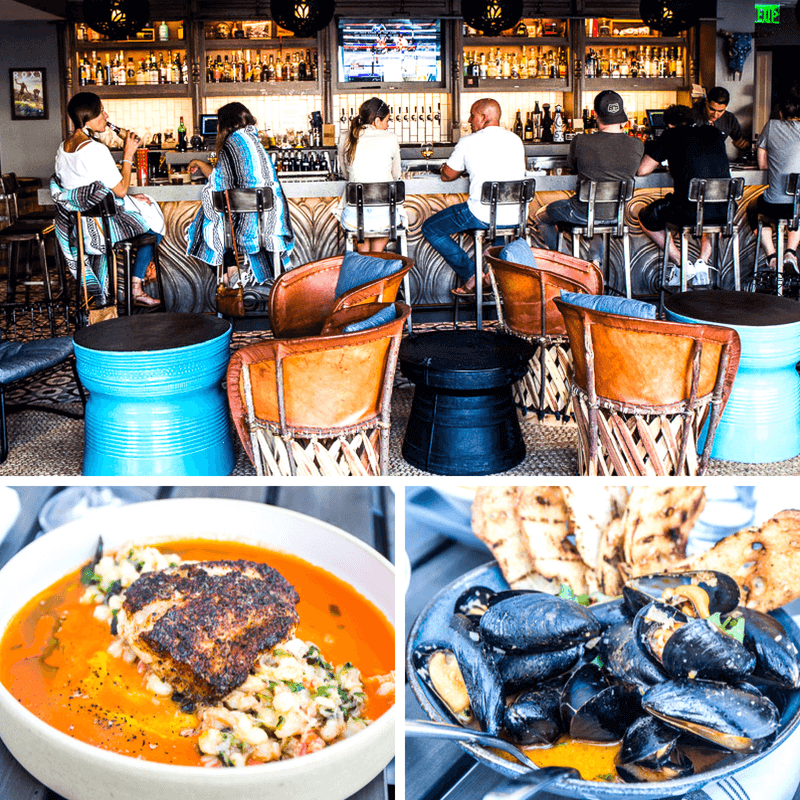 It has a fresh modern vintage vibe filled with local boutique stores, thrift stores, used book shops, and cool restaurants, breweries and wine bars. 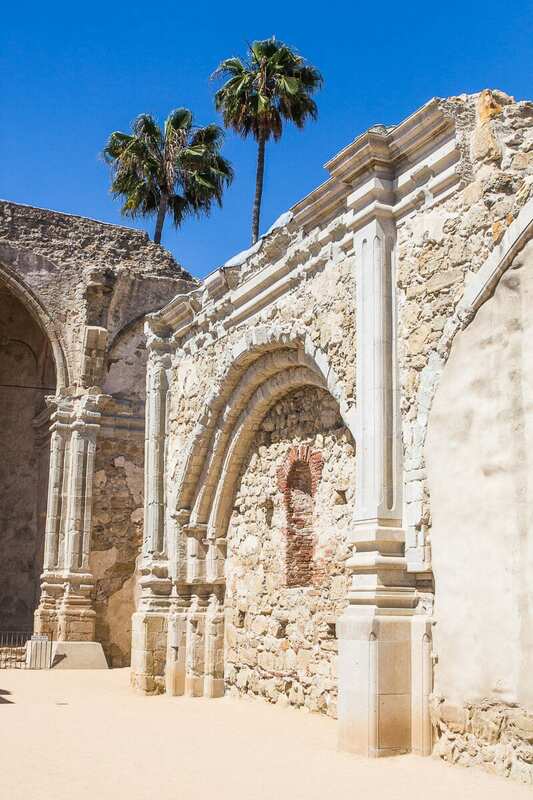 Don’t miss San Buenaventura Mission, Iron & Resin for the men, and Passport Habits for travel lovers! Time for some family bonding with foot golf at River Ridge Golf Club. We’d never played it before either, but soon discovered a fun family adventure. Foot golf is played on the golf course, you’re just kicking a soccer ball into a much larger hole. Go local in this enclave of restaurants and specialty shops which can be found at the Collective, a modern and new retail, dining and entertainment space. 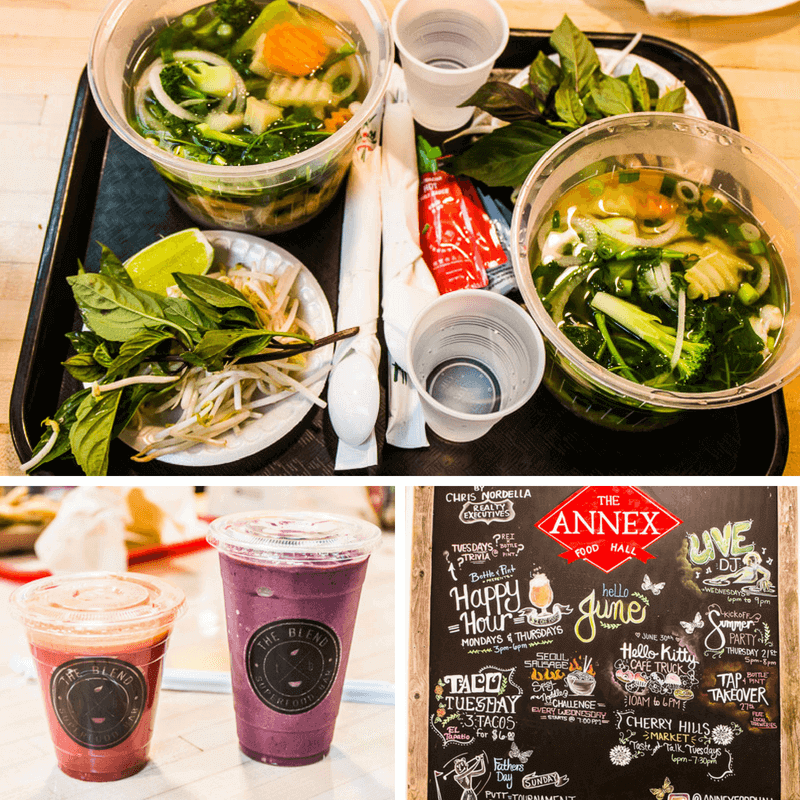 The Annex is a culinary focused, community minded marketplace, which has global cuisine ranging from burgers, Mexican, Italian, crepes, Vietnamese, Hawaiian Poke and Latin American Ceviche bowls, and even healthy smoothies. You can’t beat a Vietnamese Pho and pineapple cider for dinner. You can do a bit of shopping after, or even catch a movie at the cinema. 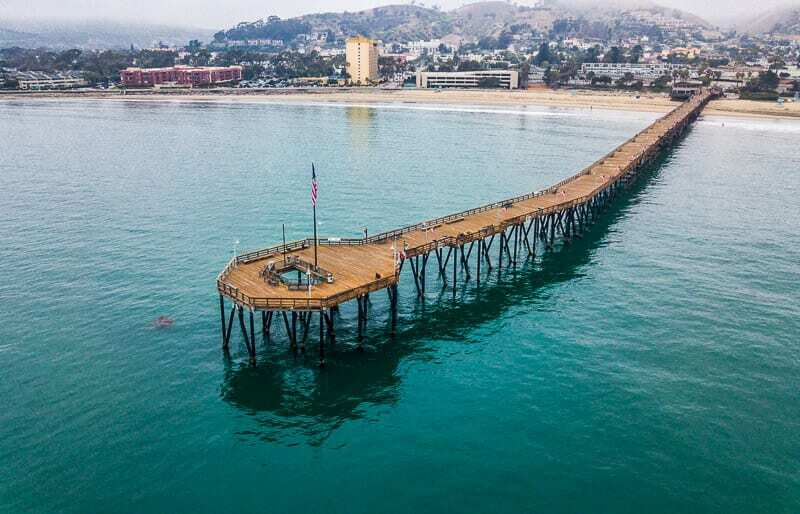 Alternatively, head back into Ventura for dinner and a sunset stroll along the boardwalk and pier. Fresh & Fabulous is a lovely local breakfast spot with typical breaky fare. 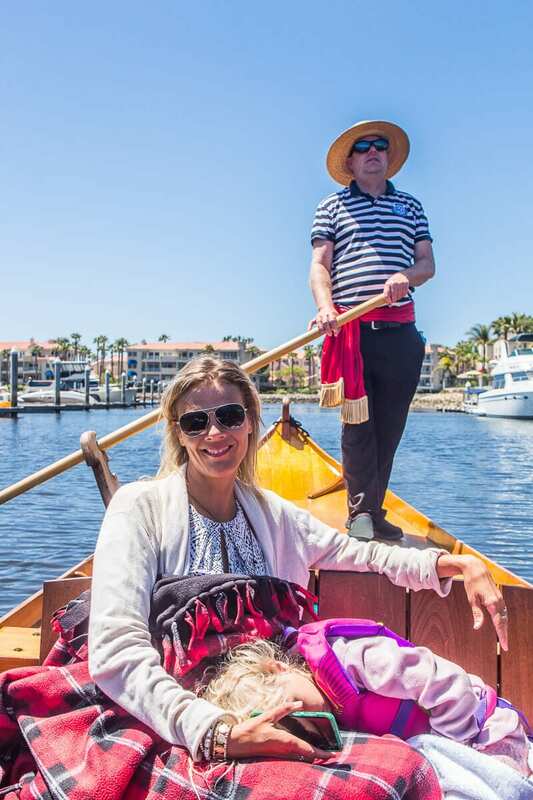 Time to slow down your body and mind with a relaxing and peaceful ride around Oxnard Harbor on a Venetian Gondola with Gondola Paradiso, minus the Venetian crowds. 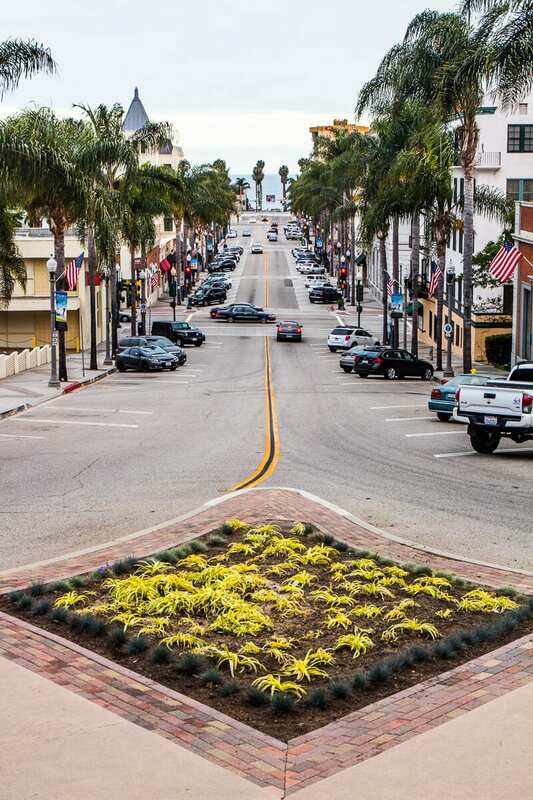 Ventura Harbor Village is a beautiful working fishing harbor, retail and dining space. 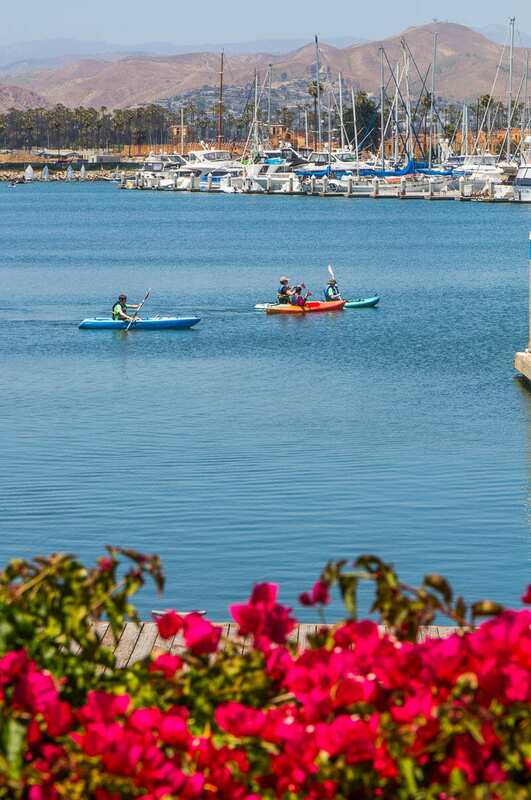 Hire some pedal boats, kayaks or SUPs from Ventura Boat Rentals to explore the harbor by water. You have a great chance of seeing the resident seals resting on boats and the wharves. This is a wonderful thing to do in Ventura on a warm, sunny afternoon. 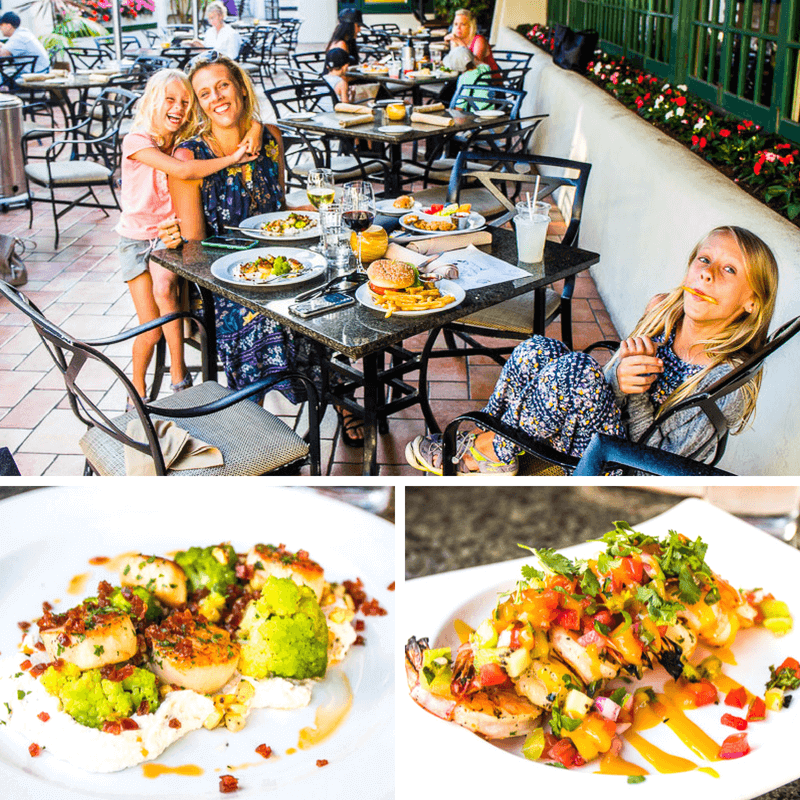 Have a seafood lunch with a view at Brophy Bros. Friday afternoon happy hour is a local’s favorite. Grab a taiyaki fish ice cream cone from Coastal Cone. Pop over the road to check out Surfer’s Knoll if you feel like a little beach time. 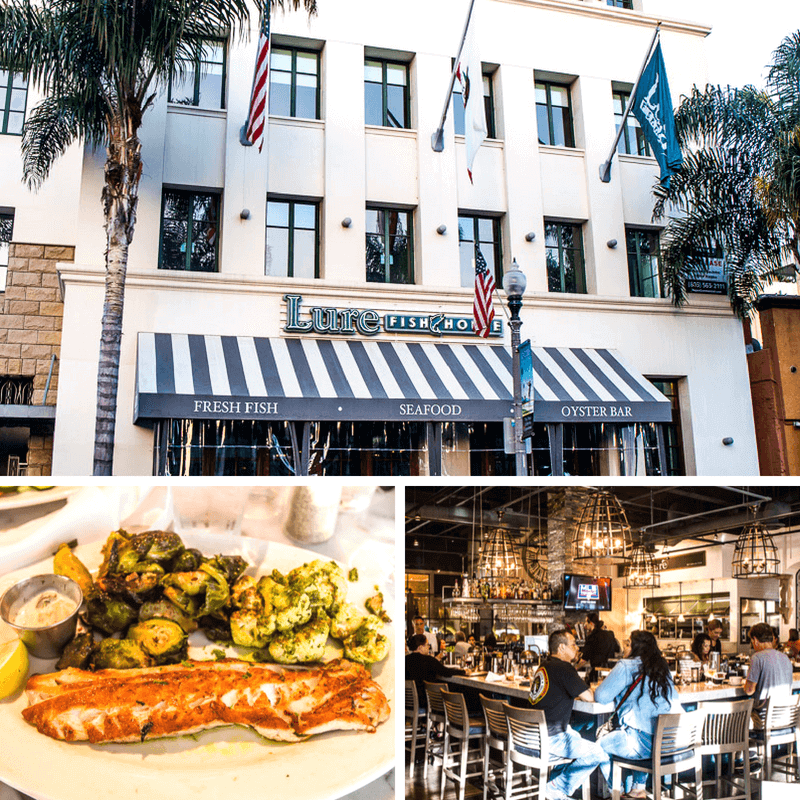 Lure Fish House is more of an upscale seafood restaurant BUT you’re still welcome in your shorts and flip flops. Ventura at its best! This is the place for locally sourced, sustainable seafood and organic produce. Perfect for families as well. 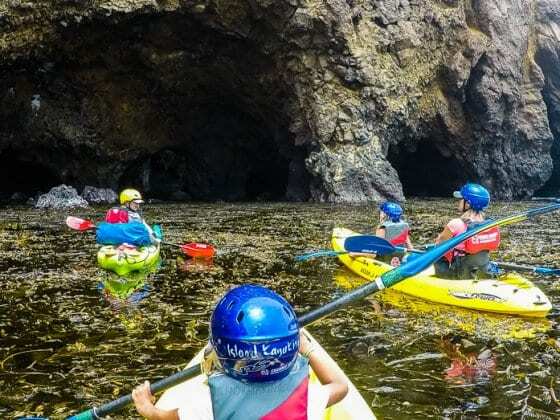 You are going to be finishing your Southern California trip with one of the best things to do in Southern California – a sea cave kayaking adventure on Santa Cruz Island. Channel Islands National Park is one of the most beautiful and unique places to visit in Southern California for adventure travel. 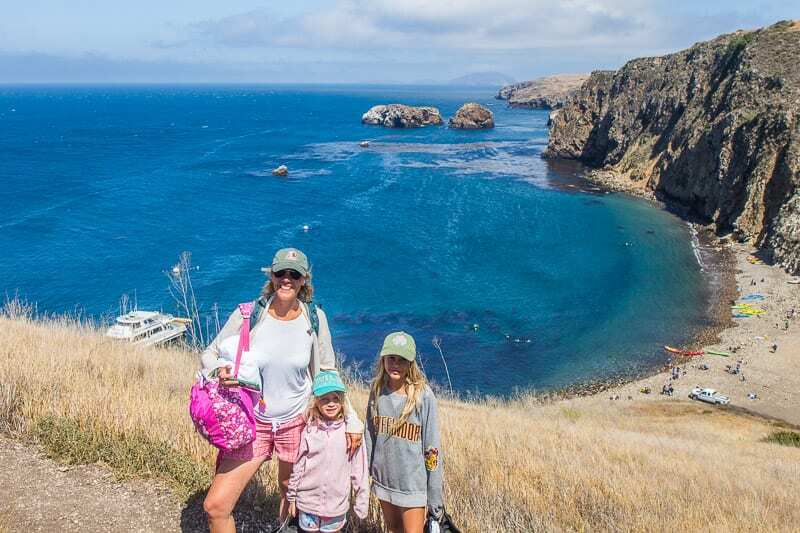 You and the kids may be a little tired after your epic adventures on the Channel Islands. 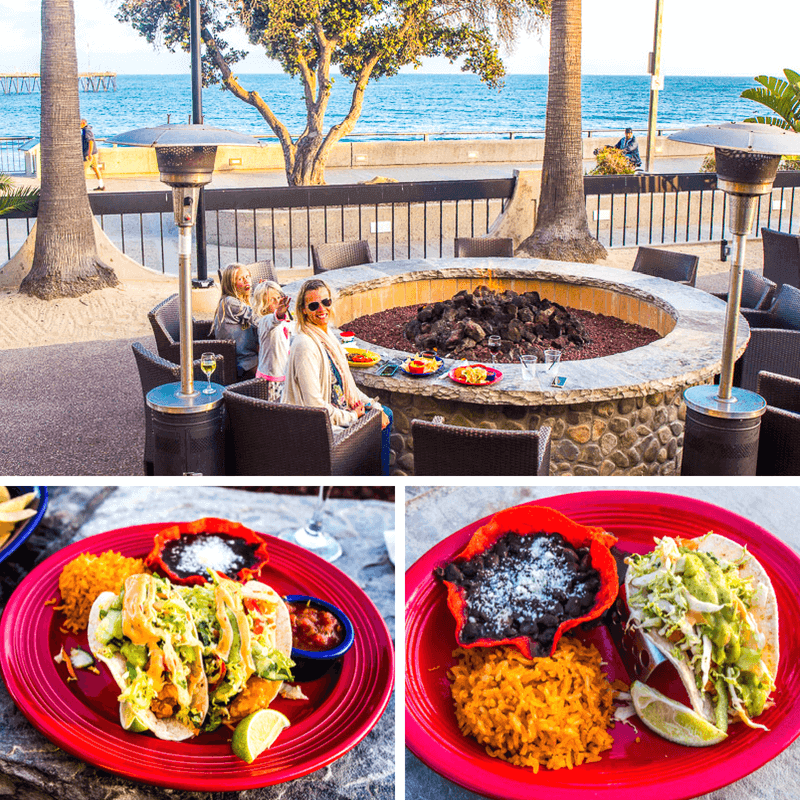 We recommend sitting out the front of the Crowne Plaza Hotel around the fire pit with your last Southern California Mexican meal from La Coscha, the restaurant inside the Crowne Plaza. The views overlooking the Channel Islands you just returned from are special, as is the sky when it turns pink to red as the sun sets. There is plenty of space for the kids to run around along the beach path should they still have endless amount of energy. 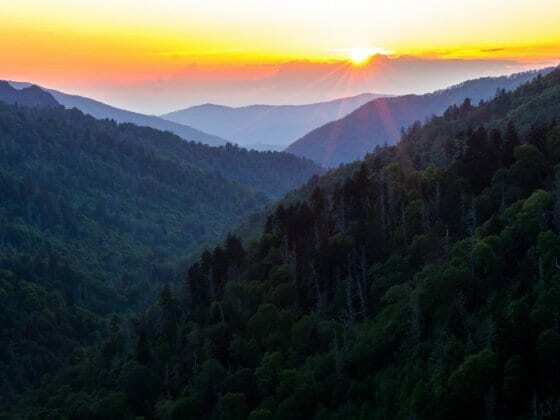 I’m sure you’ll enjoy the serenity of a cold glass of wine and casual conversation as you end what is no doubt a truly memorable Southern Carolina road trip with the kids. Click here for in-depth information about these things to do in Ventura County with kids. 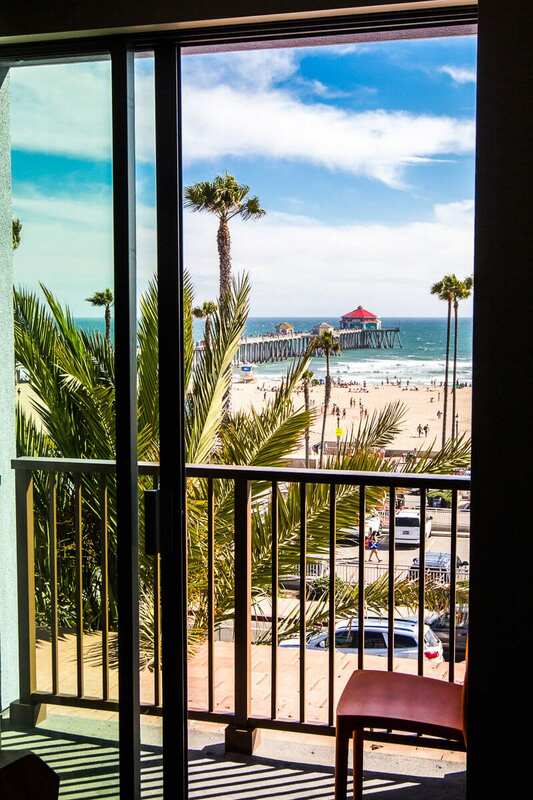 Where to stay in Ventura: Check into the Crowne Plaza Hotel on the Ventura beachfront. Read more reviews here. Here are other places to stay in Ventura. Be warned that traffic can be hectic getting back to LA, so time your drive wisely with your departing flights. You may choose to stay the night in LA. 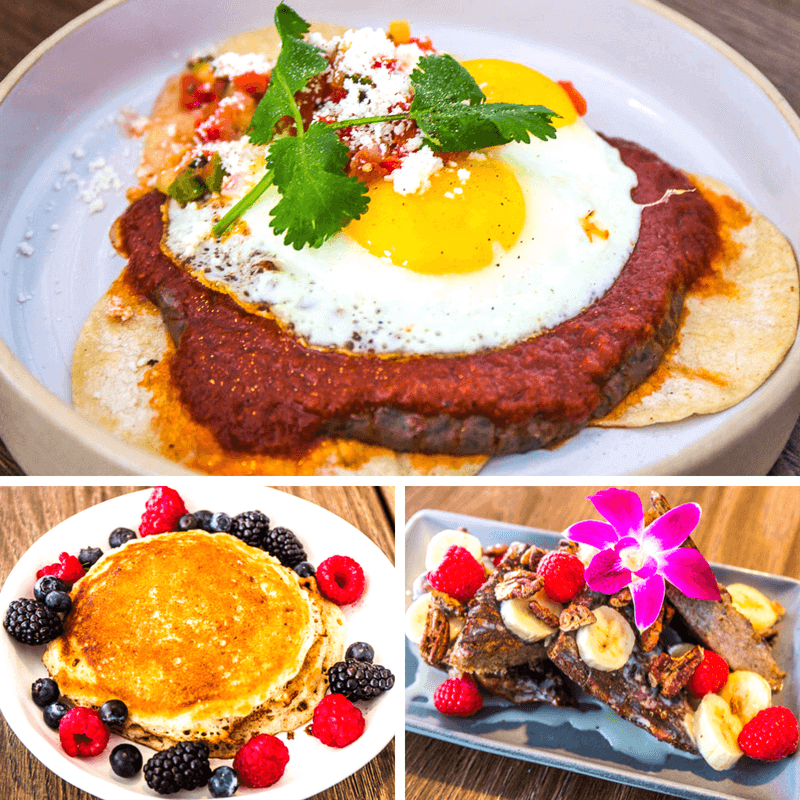 Fuel up with a delicious and healthy breakfast before leaving Ventura at Harvest Café. Drive back to LA at your leisure. We visited Disneyland in September 2018. Read all our Disneyland tips here and Disney California Adventure Park. And check out these 15 hotels near Disneyland. 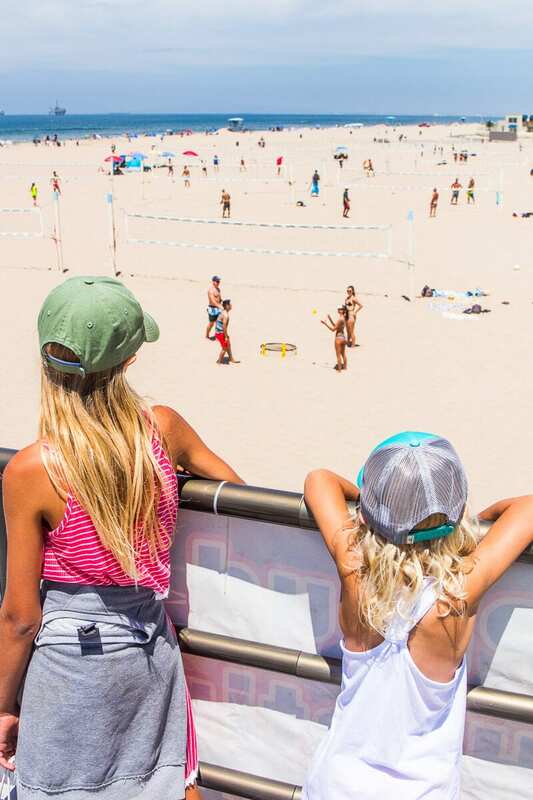 If you want to continue the SoCal beach vibe, we highly recommend spending the day at Manhattan and Hermosa Beach. 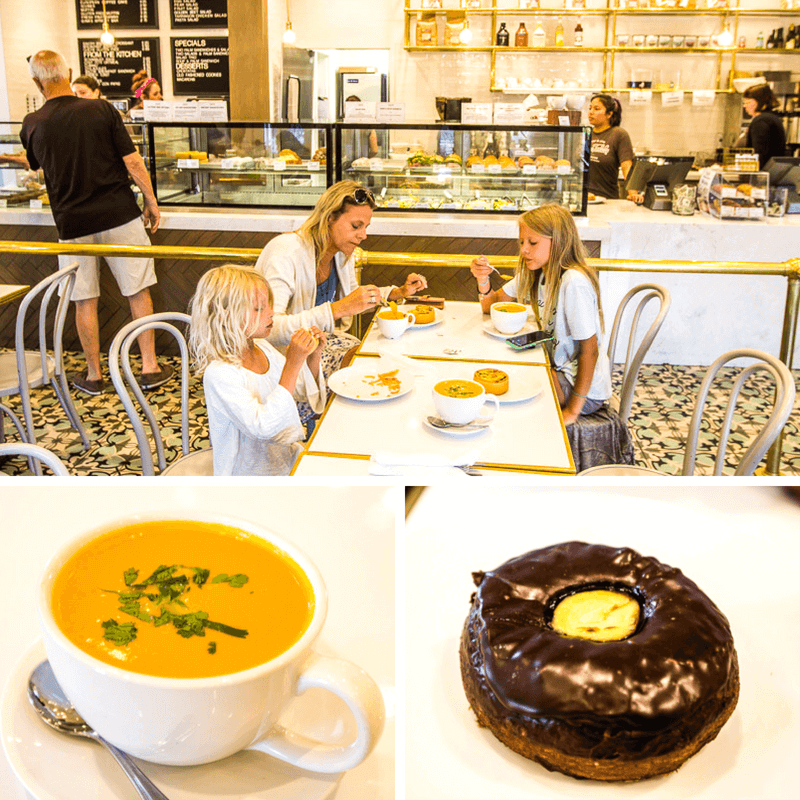 These two towns are our favorite places to visit in LA and is where we always go in LA. Grab a Wolverine smoothie from SunLife Organics (it’s one of my favorite smoothies ever) and lunch at Lemonade in Manhattan Beach. 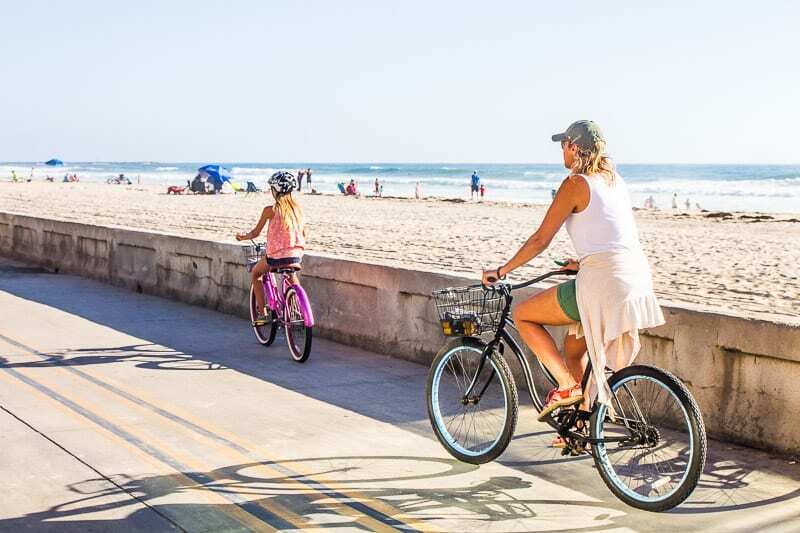 Manhattan Beach is the beach volleyball capital of the U.S. so play a game, rent a bike to ride between the two beaches, or even walk it. The main beach street at Hermosa has a lot of cool bars and restaurants with happy hour deals for dinner. Many thanks to Visit California, Visit San Diego, Visit Orange County and Ventura County Coast for helping us experience amazing destinations to share with you. 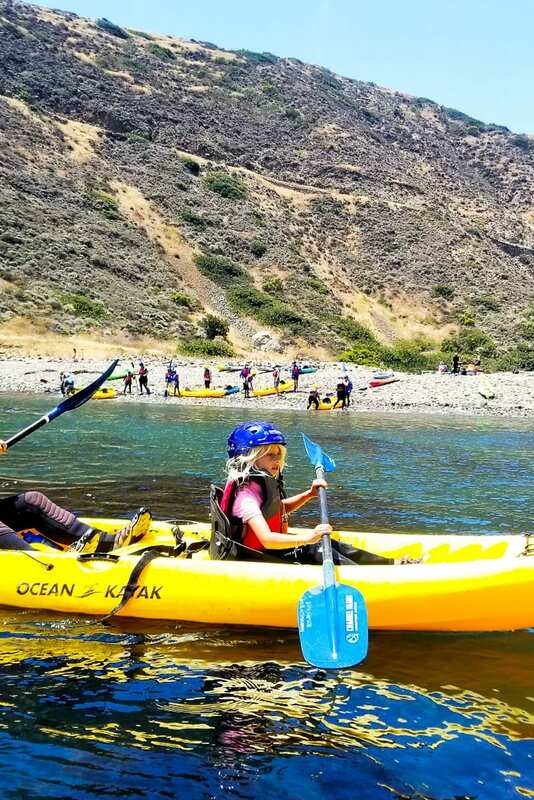 Click here to learn more about the Kidifornia Adventures on offer in Southern California and other places to visit in California. Booking.com (affiliate partner) has over 15,000 properties in California. You get free cancellation on most rooms and a best price guarantee. Skyscanner (affiliate partner) is a comparison website that searches millions of flights. Once you find your best deal, book directly through the airline (no extra fees). RentalCars.com (affiliate partner) is the world’s biggest car rental booking service that compares all the major brands like Hertz, Avis, Alamo, and Europcar. California is amazing, but generally I like to visit some curious place and go out from the common pathways prepared for tourists. With your advices I can plan a visit as I like and also taste something delicious, considering your pictures. Your article is complete, but about to use the indicated websites to reserve an hotel and especially a flight I prefer to be a bit carefull, becuase not always it is possible to find good rates. Located in the Southern California desert area 140 miles (225 km) east of Los Angeles, Joshua Tree National Park is a popular destination for hikers, rock climbers, photography buffs and nature lovers. Places of interest include an old cattle rustler’s hideout, Native American rock art and Keys View, a sky-high natural overlook that offers views of the landlocked Salton Sea. Awesome article and pictures! Love the colors and flavors of local cuisine in the pics! Southern California has a plethora of fun activities and beautiful scenery. Whether it is ancient coastal redwood trees in Sequoia National Park or the picturesque Big Sur, there is so much to experience.